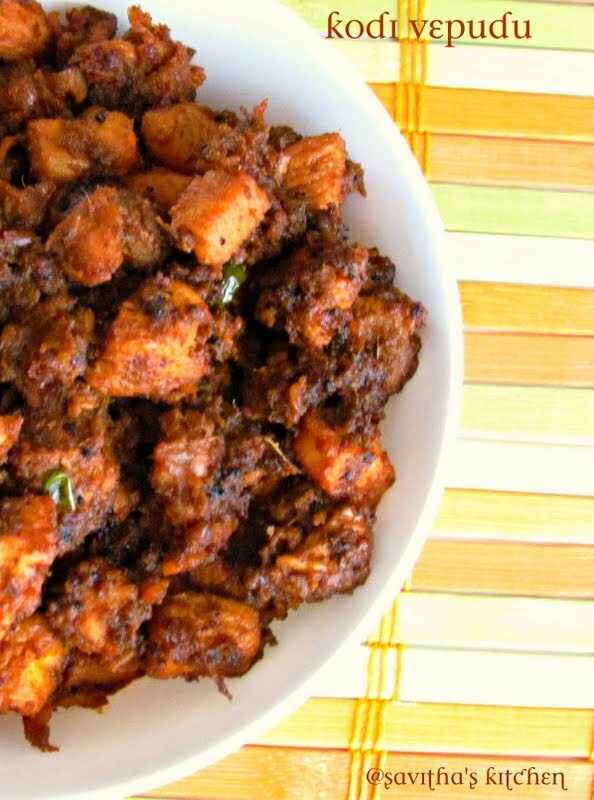 Kodi vepudu is a spicy andhra chicken fry. Kodi means chicken,vepudu means fry,this is the meaning for this name. I came to taste this dish from a Indian restaurant,next to my apartment. H and me became a very big fan for this dish from that day on. Whenever we feel like having spicy food,then we go for this fry. When I was carrying Ashwath,this is my ultimate food for my spicy cravings. Being inspired by its taste, I wanted to prepare this at home. It came out very well. This is a very spicy fry, so be cautious while feeding it to the kids. This fry goes very well with sambar rice or rasam. * Wash and cut the boneless chicken . * Grind the onion well. * Take a mixing bowl, add chicken,grinded onion,chilli pwdr,kashmiri chilli pwdr,turmeric pwdr,ginger garlic paste and lemon juice. * Mix well and cover it. * Leave the marination for an hour. * Take a pan ,add the marinated chicken and cook with 1/2 cup water. * Cover and cook the chicken untill tender. * Retain little cooked water from the chicken. * Slice red onion,chop the green chillies. * Take a pan, add oil .Temper with mustard seeds ,urad dal and curry leaves. * Fry the sliced onion ,green chillies till translucent. * Add the remaining water from cooked chicken.Let the water gets mixed well with onion. * Keep the stove on medium. * Now add cooked chicken and fry till the moisture is evoparated. * Fry the chicken till it gives out oil. * Garnish with cilantro ,serve with rice ,dal or rasam. * Dont over cook the chicken,then it might be hard. 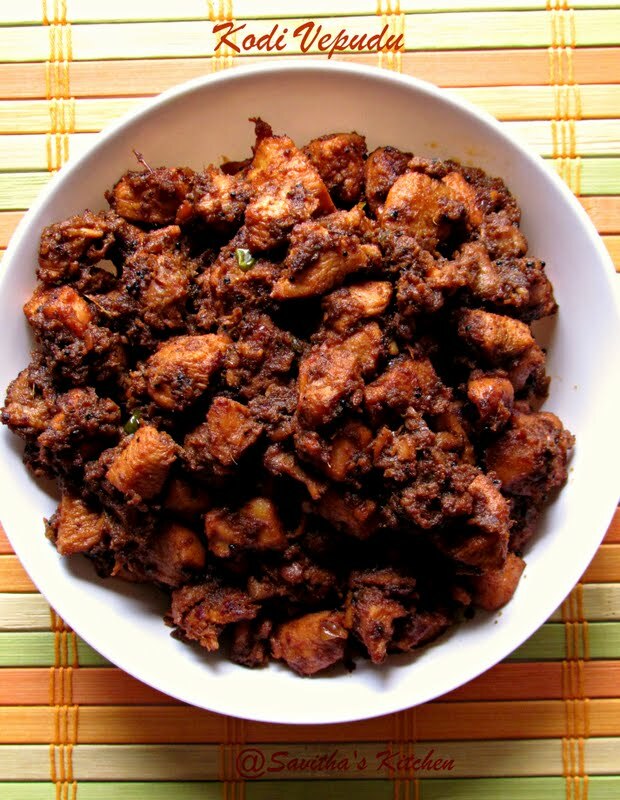 * If you want this dish to be medium spicy,then reduce the green chillies according to your taste. * Since we are frying the chicken in medium high,there are chances of the chicken to get black.So keep stirring in between. * While cooking the chicken,add less water.Because there are chances for the chicken to get hard,while evaporating the excess water. wow mouth watering yummy n spicy goodness!...nice clicks too! Beautiful clicks dear,spicy and so tempting. Grandma makes something similar..I am sure gonna try this.. but wud reduce the heat as per my palette.. This sounds and looks fiery indeed I am sure this would be ideal for spicy cravings. IT does look very spicy and mouthwatering! If you like, you can send it my Chicken Feast event going on on my blog. Thanks for participating in chicken feast event! Currently I am preparing chicken fry. I will post my comments, once I complete the process. This looks very yum! Did you try grinding the marination masalas along with the onions? I also wonder if the chicken can be cooked in a pressure cooker.